Baklava is one of those things we have always enjoyed, but had never made at home. We always thought it was way too complicated to attempt, and left it to the professionals (in this case by “professionals,” we mean any Greek Grandmother). After a little research, we found out that the secret to Baklava is that it isn’t hard to make at all! It just takes having all of your ingredients prepared and ready to assemble, and of course extra time on your hands. If you have a helper in the kitchen, all the better. Since it’s the two of us, it was astonishingly easy to make… and dare we say better than most we have had elsewhere! In our version of this classic dish we used clover honey and all of our favorite spices: cinnamon, nutmeg, cloves, and cardamom … mmmh cardamom. As long as you hit the perfect balance we bet you can add a few more, and throw the party of the century for your taste buds. Next time we are going to try making it with olive oil; this is more traditional and slightly less artery-clogging. Thaw Phyllo dough according to directions on package, then unroll. Once thawed, cover with a slightly damp towel to keep from drying out and breaking. Combine nuts in a food processor and pulse until finely chopped. Once chopped, add nuts to a large bowl and combine with brown sugar, cinnamon, cardamom, nutmeg, cloves, and vanilla bean, thoroughly mix. Melt butter in a sauce pan or in a microwave safe bowl. 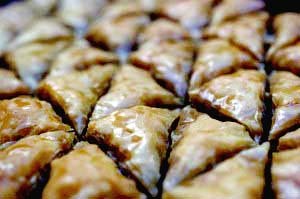 After the first layer of nuts, layer 4 sheets of Phyllo on top – brush each one with melted butter. Repeat this 3 more times: 1 layer of nuts, 4 sheets of Phyllo, 1 layer of nuts, 4 sheets of Phyllo, then a fourth layer of nuts. 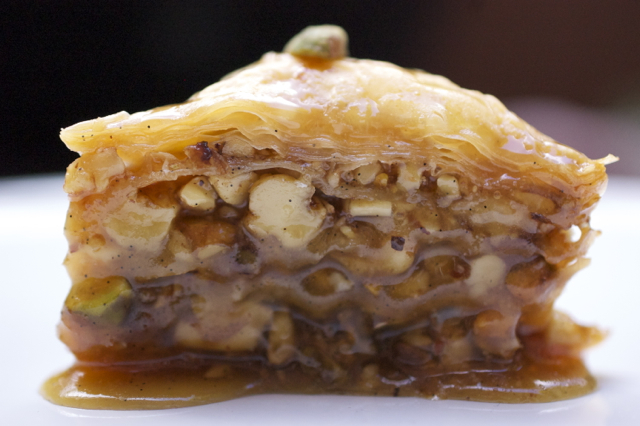 After the fourth layer of nuts, add 8 sheets of Phyllo for the top – brushing each with melted butter. If there is any butter left, pour it over top. Put the whole pan in the fridge and refrigerate for 30 minutes. Once in the oven make the syrup. To make syrup: Combine all ingredients together in a saucepan and bring to a boil. Reduce to a simmer, and let cook for 10 minutes. Remove from heat and let cool completely, remove cinnamon stick. While the baklava is hot, evenly pour the syrup over top. Let set overnight, covered with aluminum foil once cool. If you can't wait that long... no one will notice a corner piece missing. *Be very patient and gentle with the dough, and if it begins to rip, just try to push it into place. **If the top of the baklava gets to brown, tent it with aluminum foil. Cutting tips: We first cut equal squares and then cut horizontally. This made beautiful triangles. Will have to try this recipe since I adore Baklava. But on another note …… I followed your recipe for banana blueberry bread and it was delicious. 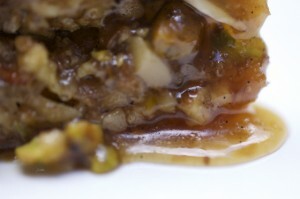 I did however add chopped walnuts … and found the crunch that it added wonderful. KEEP UP THE GOOD WORK GIRLS !!!! !